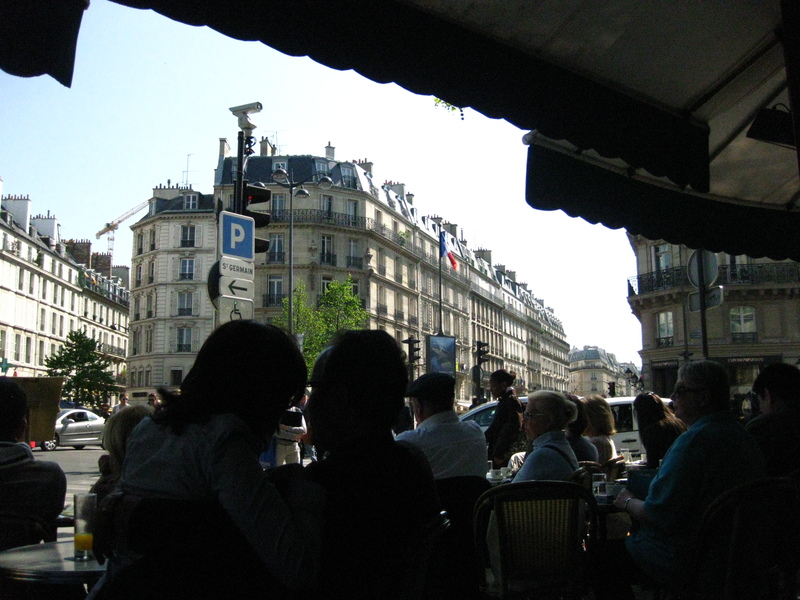 Love is in the Air: A view of Place de St. Germain des Pres from cafe Deux Magots. There’s something magical that happens to Paris in the springtime, when the city has defrosted, people begin packing onto the outdoor patios of the cafes again, and the sidewalks turn into a parade of warm weather fashions. My last trip here in January was a wholly different experience popping in and out of the metro to get from one neighborhood to the next as a quick refuge from the bitter cold. While there’s something to be said about visiting a destination city in the off-season when you feel like you’re living like a local, I couldn’t wait this time to meander around on foot with my camera, even at the risk of being out-ed as a (gasp!) tourist. Friday turned out to be one of those gloriously sunny days in the city, and a walk through the Saint Germain district serendipitously morphed into an afternoon paying homage to the written word. 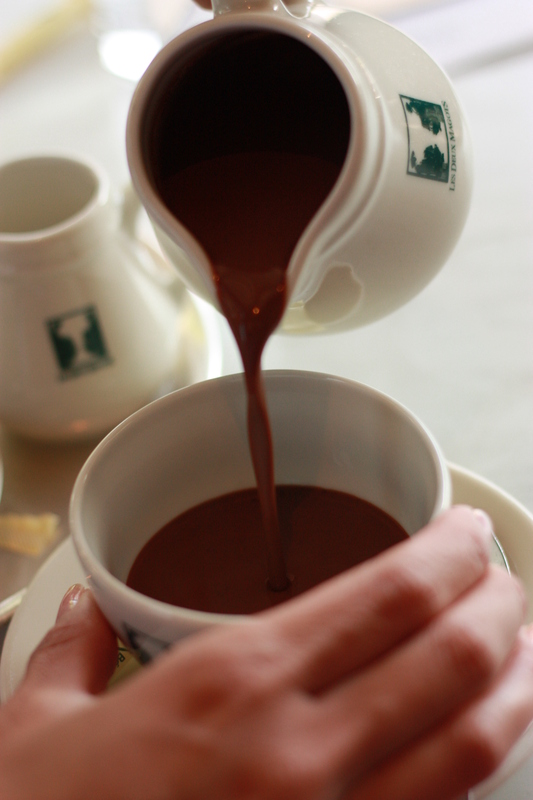 Pouring my chocolat chaud from a porcelain jug at Les Deux Magots. Photography by Edric Itchon. First stop: a café crème break at the famed Les Deux Magots (most well-known for being Hemingway’s literary haunt in the early 1900s) where my husband and I soaked in the sun on the crowded patio. Nestled among couples lingering over cigarettes, coffee and all manner of pastries, we indulged in the café’s house-made chocolat chaud, or hot chocolate—one that’s denser, richer and creamier than any version we’ve come to know of in the States. 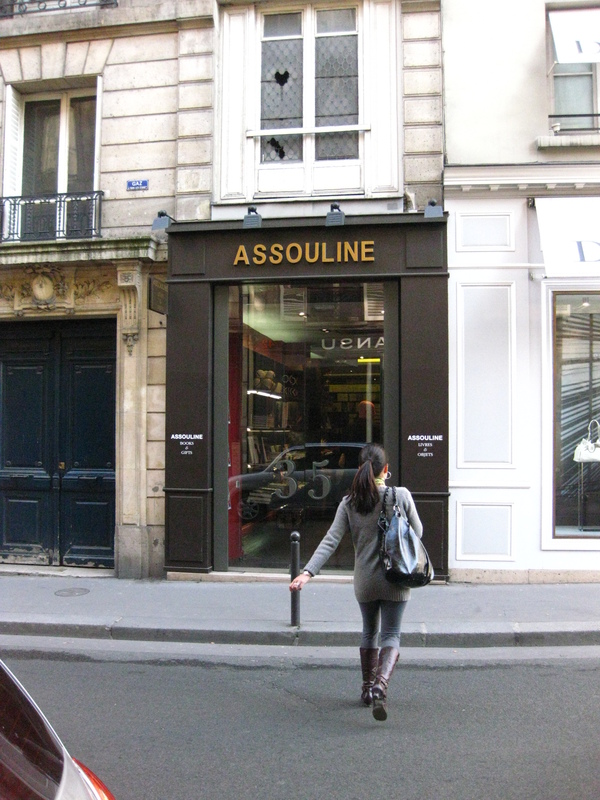 With a sugar and caffeine buzz keeping me happy, next I headed around the corner to the original Assouline boutique. In an age dominated by everything digital—from iPads and netbooks to Facebook and Twitter—there seems to be something nostalgic about a place still devoted to selling books. 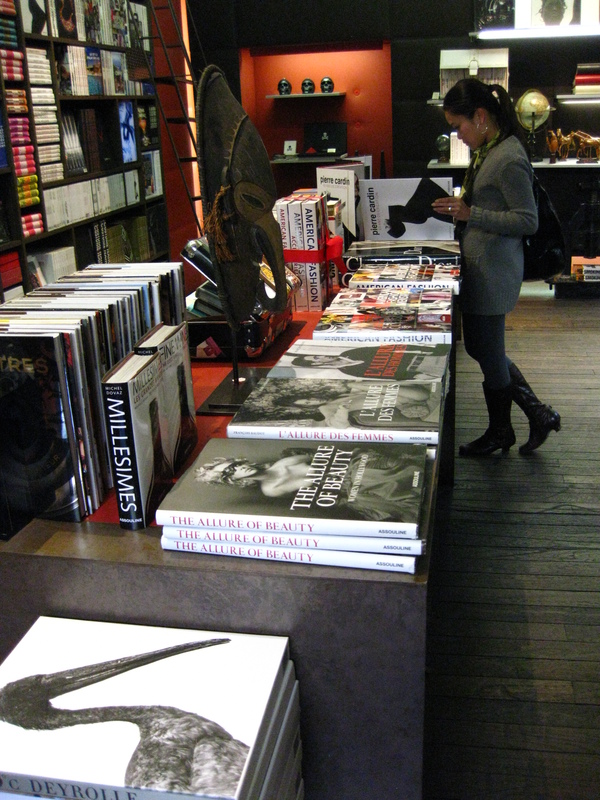 Even more special is a place like Assouline, which not only sells books on fashion, design and photography, but displays them as beautiful works of collectable art. The shop beckons you in with piles of tomes, big and small, all heavily illustrated. 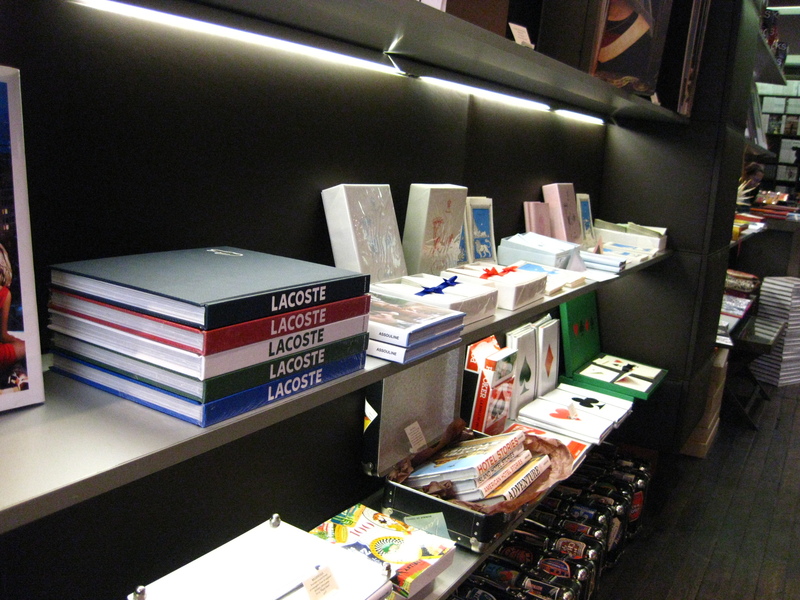 The publishing house, founded in France by Martine and Prosper Assouline, now has boutiques around the world including locations in Dubai, New York and the most recent opening in Las Vegas. 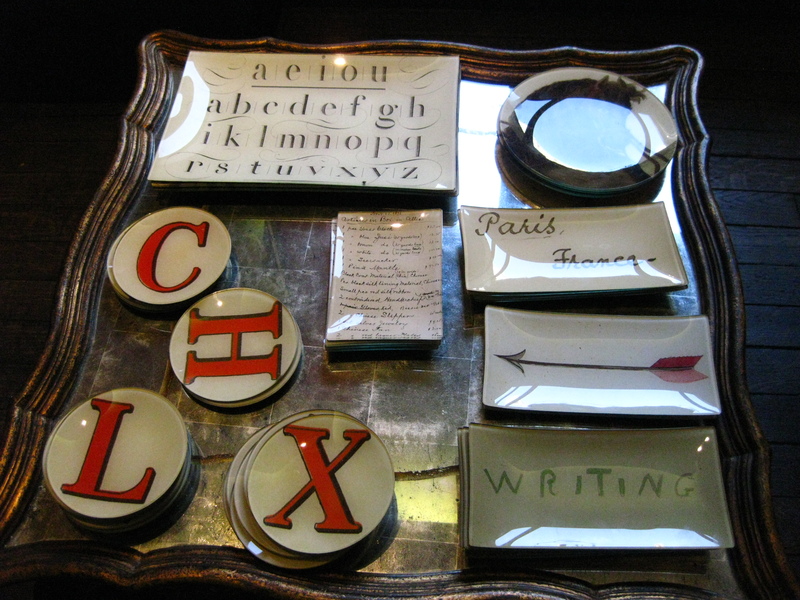 The company also expanded to selling non-book luxury items in 2002, such as a $20,000 special order Goyard signature leather trunk filled with 100 Assouline memoir titles and these slightly more affordable glass paperweights (pictured below) that retail for 75 Euro or about $100 each. For readers in the Bay Area, check out the “Assouline Corner” shop-within-shop concept at the Neiman Marcus Union Square (150 Stockton Street, San Francisco). As you can imagine, there’s much talk in the literary world of what will happen once e-books take hold. One trend that already seems to be underway is that the book arts are flourishing–handcrafted physical books are being created and coveted more for their artistic merit than their utility. So in a way it’s sort of a bifurcation: electronic reading on one hand, art object on the other. Interesting to know from a published author what the pressing topics are in the literary world. Is there also a camp of authors who tend to be more pro e-books? Like a lot of writers, I’m curious to see how the e-reader trend will affect the publishing industry! I’m not an expert on the business side of things, but it seems like there’s an issue with Kindle sort of screwing over publishers and writers since Amazon has so much leverage–but everyone expects that to change now that the iPad is creating competition. But as long as writers and publishers get their share, I’m pro-e-book. Great food tastes good whether you eat it with a fork or chopsticks, you know?